Part 1 Introduction: Keys to new product success and failure. Part 2 Key requirements for successful product development: Developing an innovation strategy; The product development process; The knowledge base for product development; The consumer in product development. Part 3 Managing and improving product development: Managing the product development; Case studies: Product development in the food system; Improving the product development process. Product development is the lifeblood of the food industry, from refining an established product range to developing completely new products. It is, however, a process fraught with risk that often ends in failure. So what then are the keys to making the process a success? Drawing on a wealth of experience gathered over 40 years, Food product development provides the answers. the business strategy directing product development; the various steps in the product development process; the knowledge required to fuel the process; the need for keeping the product development focused on the consumers needs and aspirations. The second part of the book looks at managing the product development process in practice with four case studies of successful product launches. It also discusses how to evaluate and improve the process to make future product innovation more successful. 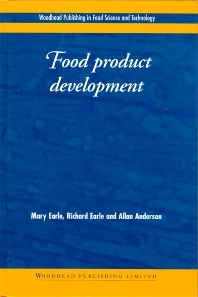 Filled with examples and practical suggestions, and written by a distinguished team with unrivalled academic and industry expertise, Food product development is a essential guide for R&D and product development staff, and all managers concerned with this key issue throughout the food industry. Allan M. Anderson is Chief Executive of the New Zealand Dairy Research Institute, the central R & D organisation for the New Zealand dairy industry, and has extensive experience of managing successful product development projects.